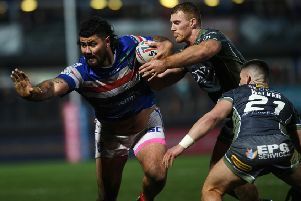 Wakefield Trinity Wildcats restored their pride with a much-improved display in Friday night’s Super League clash against St Helens at the Rapid Solicitors Stadium. After the previous week’s 58-16 thumping at Widnes Vikings, James Webster’s men defended far better as they went close to toppling champions Saints. Wildcats forward Ali Lauitiiti takes on the St Helens defence in Friday's game. The Wildcats led 12-6 at half-time but were eventually pipped 20-16 after paying dear for missed chances.